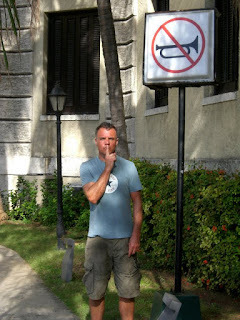 So I'm writing the beginning of this blog 4 days into our trip to Cuba, due to a lack of forethought at Gatwick. For some reason, I didn't buy a journal and thought I would be able to buy one here...the first of many incorrect assumptions...! 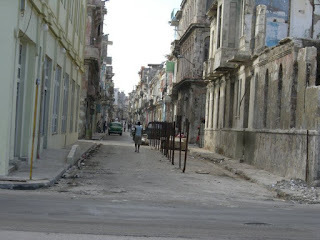 We took off from Gatwick at 11.45am on the 10th October 2010 to begin an 11 day whirlwind tour of Cuba. 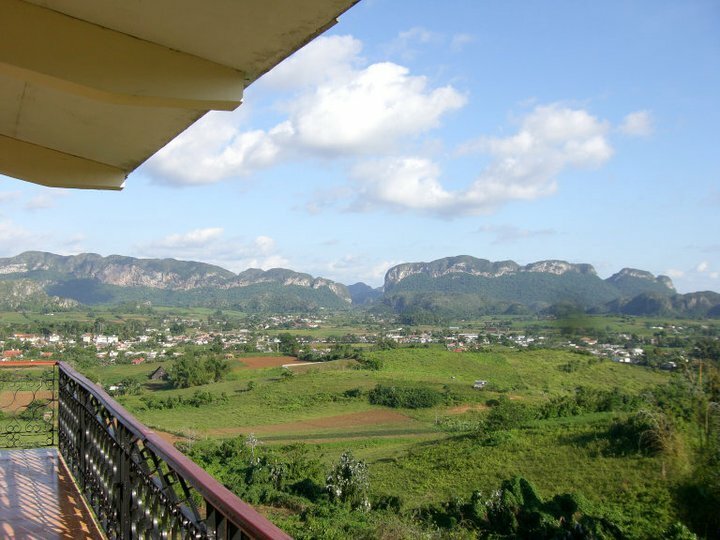 We had planned to have 2 nights in Havana, followed by 3 nights in Pinar Del Rio, a province of North Western Cuba famed for its coffee and tobacco plantations as well as its national parks. 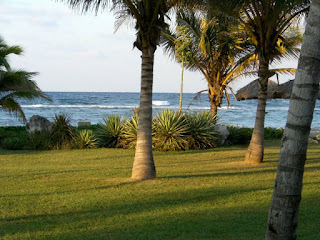 We were then transferring to Jibacoa to spend 4 days in a beach resort, albeit a quiet, non-touristy one, and then a final night in Havana before heading home. Stevie hadn't been to Cuba before; in fact he has never set foot in South America OR the Caribbean, something I was surprised about for someone so well traveled I have been to Cuba before, but with an ex-boyfriend whose idea of an adventurous foreign holiday was to drink foreign beer in a different bar, so I was looking forward to what promised to be a very different trip. After a 9.5 hour flight, we touched down in Havana, to slightly overcast but still warm afternoon. Having negotiated customs and survived a minor heart attack due to a tardy suitcase, we got a taxi to the Hotel Florida (don’t be put off by the name!) which was our chosen hat-laying place for the next 2 nights. The staff on reception were pleasant and helpful, and we decamped to our room through a beautiful central courtyard. Now I'm no princess, if you have read my Kilimanjaro blog, you will know that I am not shy of “non 5*” situations, but I do object to being greeted by the sight of other people’s pubic hair in my hotel bathroom. A lot of it. But....this is Cuba and cleanliness is not next to godliness...Che Guevara is, but more on that later. Having showered the journey off, we headed out into the streets of Havana, taking in a Mohito or two in bars along the way. Using our Lonely Planet guide (The Bible), we figured out that the Restaurant El Patio on one of the sides of Cathedral Square was a good bet. We lucked out with a seat on the balcony, overlooking the square, with a beautiful view of the Cathedral, its spires, and a band, oddly situated on a catwalk. The food was mediocre, but the toilet attendant gave me flowers (the waiter explained to Stevie that he had fallen in love with me. He was 80 if a day. But he did look like a bit of a goer, mind, maybe I should have given him Grandma’s number!) The band were passable, until an odd version of Careless Whisper with at least double the correct amount of notes in it. There was a strange and imaginative catwalk “performance” every 3-4 tracks. But all of this simply added to the charm and we walked home exhausted. We woke early (jet lag?) and had breakfast. A challenge in itself, Tuna Pizza and a juice that tastes like gone off milk, anyone? We walked several miles along the coastal line as we had discovered that it was a public holiday in Cuba and so nothing was open. However (Becky Cole, take note) we happened upon a hop-on/hop off tour bus and spent an hour on a tour of Havana. 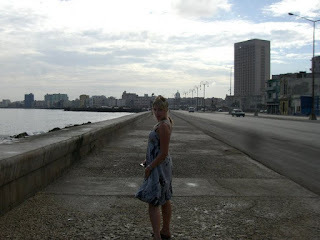 Havana (Habana to the locals) is split into 3 districts- Vieja (old), Centro (Central), and Vedado (the tourist bit). We seemed to be shown most of the plush hotels and not a lot else. But we did get a brief tour of the foreboding ‘Revolution Square’, where there were huge murals using metal on the walls- about 40M each, of Che Guevara and other revolutionary heroes. It was stark and very Soviet in style, and quite something to view. We got off the bus at the Hotel Nacionale, well known for being where, in the 50/60’s, there was the biggest ever Mafia gathering, under the guise of them all being in the same place for a Frank Sinatra concert. Maybe Uncle Chuck was there, huh Dad? (Uncle Chuck was Sinatra’s PR man, and in all the pictures I have seen, makes Don Carleone look like Dale Winton.) We had a Mohito (obviously!) and some lunch and then began the walk back to our dirty, but charming hotel. This is when the fun began. Looking as we do, just off the boat, we were immediately accosted by a couple, Alberto and Mary, who, after a few introductions, offered to take us to the best Mohito in town. We agreed, and followed them into the darkest, dingiest bar I have ever been to. I had read that it was quite normal for Cuban people to take you to a bar, introduce you to some real Cuban life (half of Mary’s family were in there! ), chat for a while and the tourists pick up the bill...in fact the LP guide recommends it, as it’s a good way to REALLY find out about the country. So we did. After 3 mohito’s, Mary and I ended up swapping addresses...and bracelets (hers a wooden 1 peso bracelet, mine an £80 Chlobo solid silver one....) and Stevie bought 8 cigars from Alberto, who works in a cigar factory and had had the good grace to pocket some. Then came the odd bit... a sob story about not being able to buy milk, etc, so, being the kind souls we are...off we went and spent 27CUCs on milk and a razor for Alberto’s head. So we got stung. But the odd thing was that we didn't really mind. These people have nothing, and were great company and we learnt more about Cuba in that 2 hours than we ever would from a guidebook. Havana is a curious city. I think that Stevie fell in love with it, but I'm ashamed to say, that despite my excitement, I struggled. It’s a paradoxical place, magical in its obvious time warp, with dilapidated, colourful buildings with peeling paint and dangerous scaffolding all too obvious...but then the seedy underworld shines through. With barefoot children scampering through from one tenement door to another, mangy, flea-ridden dogs on every street, cockroaches and and dead rats become so common that you automatically learn where to step to avoid them. But if you can look past all that (and I did after a while), then you meet wonderful friendly people against a backdrop of beautiful old American cars, who WANT you to love the city that they are so proud of. The big gas-spewing American cars make you feel like you are an extra in Grease, the buzz of the city and the music make it feel like the centre of the world. But, like many 3rd world countries, there is an underlying sense of humility and guilt. Guilt that we have more than them and humility that they cope so well. And so, we had breakfast and walked through the city once again, this time stopping off at Belle Artes, an art museum in Habana Vieja- a stunning building which was made to feel ever so stark because of the palatial interior. With only a few rooms of artwork, it was an interesting trip, but again, slammed home the feeling that the Cubans, despite being ever resourceful, seem to be....well....getting a bum deal for want of a better phrase. 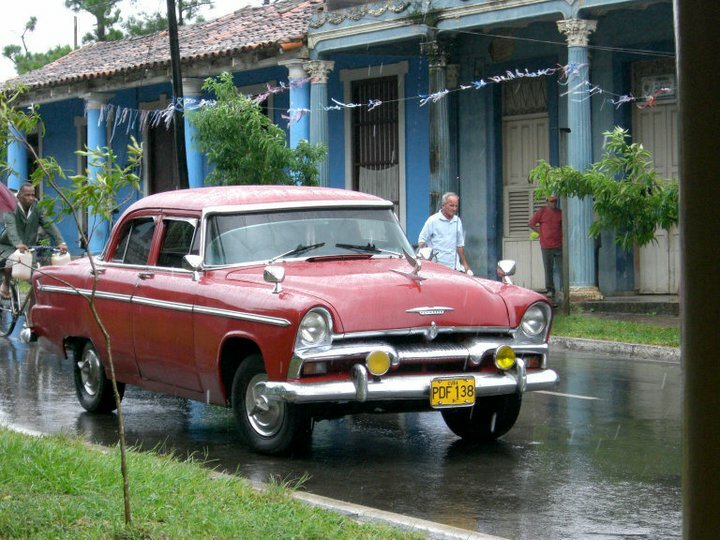 Our taxi arrived at midday and we began a 2.5 hour boneshaker of a journey to Pinar Del Rio. Arriving in Pinar Del Rio could easily be described as a cliché, rolling hills, mountainous countryside, yaks pulling the plough through the fields and the locals sitting on rocking chairs outside pre-fab houses. Our hotel looked ideal, with a view over the hillside, looking out over the Cuban tobacco fields. We unpacked and optimistically put our swimmers on- it was VERY cloudy. We had a sandwich at the bar- no gastronomical treat, its Tuna, Cheese or Ham, and relaxed for the afternoon, dodging the rain and spending some pesos at the bar. Using our trusty Lonely Planet, we decide to go to the Don Thomas restaurant that night. Well, when I say decided, it’s the only restaurant in the village, so it didn't take long. However, as we were booking the following days horse trek with Matthew, The “PR” (in his own words!) of the hotel, he shuffled over to us in a sly manner and explained that he could send us to his friends house for dinner...we would be picked up at 8pm from the garage in town and taken there. In Cuba, all restaurants are state-owned, and then there are Casa Particulars, run from home, which are allowed by the government but they have to pay extortionate taxes and are not allowed to serve beef, shrimp or lobster- the government has a monopoly on those. However, Matthews place was a secret Casa and the government supposedly has no idea it exists. We met a lovely Cuban dude in a GAP t-shirt at the gas station at the allotted time and he led us to and through his house to an area at the back next to some building work, under an awning. The table was laid out and it was a sweet moment- his mother then gave us the best meal that we had had in Cuba- Tuna steak, veg and salad and a black bean sauce. Brilliant. It was a perfect example of the Cuban people finding ways around the dictatorial government to make ends meet. There, we met an Brazilian called Avery, who was travelling on his own....in return for his wife getting 2 new bathrooms!! He was a real character, making us promise to call his son who works in Nationwide in Bournemouth, to meet up with him. Something I know that I have to do soon....! We left the casa, happy, full and with a new best friend! We awoke early, as usual at 6am, and I swam some lengths whilst Stevie went for a run...watching the sun rise every other length, changing colour before my eyes was beautiful. Breakfast was mercifully good (the first one so far), omelette, toast and fruit. Then came the bit that I had been looking forward to since I booked the flights- a day’s horse riding through the Cuban valleys and farmland. We were met by our very own Spanish speaking John Wayne, and introduced to our horses- Mine was called Chickadee (Katie Littler take note!) and Stevie's was Auchero. Also joining us was a Dutch couple and a Flemish couple.. It was basically 3 girls who had dragged their partners along, all three of whom were standing next to the horses, petrified. The women mounted the horses with excitement whilst the men communicated in broken English and sign language the fact that they REALLY didn't want to be there...But, after 5 minutes, everyone was plodding along and the fear was forgotten as we all looked in awe at the scenery around us. 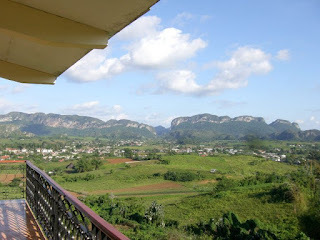 The Mogotes (mountainous rock formations) were one side and the valleys the other, and we rode for nearly 2 hours, taking in the banana tree field, the sugar cane plantations and the stunning, lush Cuban countryside. We passed a school, many small houses and farms and really felt like we were fortunate enough to be experiencing Cuban life as it is, rather than what the tourist guides and government want you to see. We stopped after a while and dismounted (to the relief of the boys, as our horses had begun, spontaneously to trot every so often) at a farmers house that was truly in the middle of nowhere. Here, we were given bananas picked straight off the tree, sliced oranges and coffee made from the beans that the farmer had grown and roasted earlier in the year. Farmers in Cuba tend to be multi-taskers as the natural resources and skills are not that plentiful, so this particular dude grew coffee, tobacco, bananas and oranges. I tried coffee for the very first time...and was pleasantly surprised...and was reassured by the coffee drinkers amongst us that it really was very good. 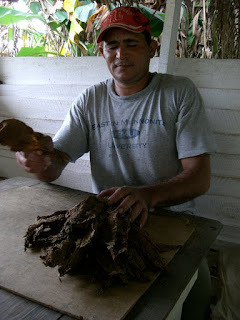 We were then given a fascinating demonstration by our guide as to how tobacco leaves were grown, harvested and made into cigars. We each were given a freshly rolled cigar, which we smoked a bit of and saved the rest for a later that never came. We remounted our horses and rode back to the hotel- mine always insisting on being at the front and away from everyone else, which pleased me greatly! Saddle sore and flushed (read- sweating), we arrived back at Hotel La Ermitas and headed to the bar for a...cheese sandwich. The weather was going rapidly downhill, so we polished off a basic late lunch and then sat on our balcony, relaxing and reading...and me writing this blog. We decided to return to last night’s Casa, certain that it was the best food available in the area, and had the lobster that Avery recommended so highly the night before. We walked a mile to the Casa where we were greeted like returning heroes, and gorged ourselves on lobster, avocado, beans and rice, enjoying every minute of this unusual and personalised experience. Me- Hi there, can I get a Mohito? Me- Oh, ok then- how about a white wine? Me (thoroughly confused) - Oh, lovely, thanks. ...and duly a foul glass of red wine appeared at my table. The storm seemed to pass quite quickly with some extremely strong winds, a few crashes and squeals from the guests as the tiles from the roof flew off, one by one, narrowly missing the people attempting to run from one part of the hotel to another. Having eaten truly the worst meal I have ever had in the restaurant (yes Bex, even worse than that restaurant in Budapest!!) which consisted of a starter of tinned mushrooms in vinegar, and seafood spaghetti, which was Heinz tinned spaghetti, I swear- Stevie made the executive decision that, no matter what the weather was doing, we would find a casa to eat in that night. And off to reception he marched to find our friendly dodgy-dealer to sort something out for us. He returned 10 minutes later, bedraggled, soaked to the skin, accompanied by my howling with laughter, but with a triumphant look on his face. Our contact had got us two seats in a nearby casa, only 100 yards from the hotel...just one hitch...the storm meant that they had no electricity. Fine, I said, let’s go. We walked down the road until we met our host for the evening- a “big, bald white man who look English”, and across a carpet of pine needles, branches, cones and other debris, we clambered up hills, through a small clearing in the trees and then down some treacherous wooden steps into a simple, pretty shelter at the back of a small house. As with the previous Casa, there was no menu, instead a selection of dishes are presented to you. It seems that the Casa’s all go by the same rules for tourists and we were given Lobster, banana chips, avocado, black beans etc. And all of this prepared, cooked and delivered in a constantly extinguishing candle light. The meal and wine cost about 30cucs (around £20) and was 100 times better than any restaurant that we could have gone to- with the added bonus that we were contributing to the normal peoples economy rather than a state run restaurant. We paid the bill and then were guided expertly back through the carnage of the storm to the hotel, where we had a brief chat with the Dutch couple who were supposed to have left that day for Cayo Leviso, but couldn't because of the weather. An early night, and we managed to sleep through the winds that snapped the trees out the back of our hotel clean in half. I awoke to the calm AFTER the storm and went for a run down to and through the town. The effects of the last 24 hours were clear to see as I jumped over fallen branches and broken trees every few yards. Running in this part of Cuba in the morning is fascinating...most animals are left free to roam, so I was followed at various points by dogs, chickens, turkeys, ducks, cats, and horses and dodged bulls and water buffalo. I felt like the fricking Pied Piper in Lycra. I was constantly surprised by the Cuban people, who seemed to emerge from bushes at the side of the road, all heading off to their days work. The innate friendliness of the Cuban people is very noticeable in this farming community, so despite the confusion of seeing this small blonde girl in lycra with an I-pod strapped to her arm, being followed by a tail of chickens, I was greeted by a cheery Hola by almost everyone I passed. After breakfast, we bode farewell to our “fixer” Matthew and watching the town come alive again, plant pots being returned to position, signs being re-hung and roads being cleared of debris, we drove out of Pinar Del Rio to begin the 4 hour journey to Jibacoa, where we had chosen the “only swanky option” in the area- The Breezes hotel, for a little luxury towards the end of our trip. 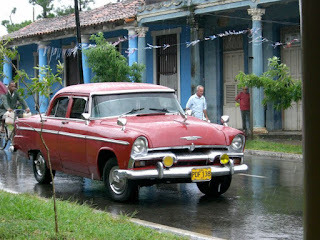 The journey itself was fascinating, and listening to my IPod, I watched as small villages, industrial towns, farming communities and even the suburbs of Havana sped past my window. Driving, or rather, being driven, in Cuba is a terrifying experience. There are no seatbelts in the Taxis, and the roads have as many horse and carts on them as they do cars, meaning that sudden breaking and immediate lane-switching is alarmingly common. We arrived at our hotel, and after a brief, heart stopping moment when the Taxi driver returned Stevie’s wallet which he had left on the backseat, we checked in and were led to our room. The initial feeling of relief that we had a clean, well looked after room with French doors straight out to the beach strangely gave way to a disappointment. I had desperately wanted something off the beaten track, not a large, beachside all inclusive...which is exactly where we had ended up. This may sound ungrateful, and I had no-one to blame but myself, after all, I had booked it! I allowed myself to sulk with my spoilt brat face on (you know the one, Dad?!) throughout the all inclusive buffet lunch- lucky Stevie- and then pulled myself up and decided to take it for what it was, and headed to the beach. The evening was...interesting...there was a great dinner served in one of the 3 restaurants...smoked salmon, salad etc, all totally up my street. There was a show on at 9pm in the main pool area, a stage and all sorts- surely that could be fun? Well, girls, you would have loved it- Sammy, once they got onto Mambo Number 5, and followed that with Rhythm is a Dancer, I was thinking of ways to fly you over! It was essentially like watching Terry Wogan and Mitch Winehouse, with the BBC weathergirls put on an all-singing, all-dancing extravaganza. As they launched into We Will Rock You, we retreated, laughing at the absurd spectacle we had just witnessed, to our ocean view patio for a glass of wine and an early night. The next three days passed leisurely and to save us all the boredom of daily descriptions of my sunbathing positions, I haven't written daily blogs. I began each day with a gym session in the ancient, but certainly usable gymnasium on the beach. It was a great way to start the day- cycling or running whilst looking out over the ocean. The rest of the day was lazy, as expected, and simply required a little sunbathing on a beautiful beach, some snorkelling (mainly Stevie, my early age viewing of Jaws still means I am nervous of the sea), long lunches (finally some good food!) and cocktails in the evening. I felt guilty to start with for doing pretty much nothing, but it was what we both needed. However, and I am sorry to any of my Canadian friends and family who are reading this, because I KNOW that you cannot be compared to these people, but the relaxation of Jibacoa was marred by the realisation after a few hours that 90% of the population was Canadian. Which was fine. Fat Canadians. Also fine. Fat, loud, greedy and often rude Canadians. Not fine. These people had actually bought flasks with them so that they could make the most of the free booze without even having to get up off their asses to refill. They ate 3 plates of food for every meal, piling the desert plate particularly high. They NEVER did anything other than eat and drink- we heard one story of an arranged 25 minute hike around the area which began with 14 people and only 4 people made it- 25 minutes!!!!! Anyway, rant over- but it did put into perspective a lot of my own personal self-doubt and body issues- and made me grateful for the eating habits and manners that my parents beat into me. 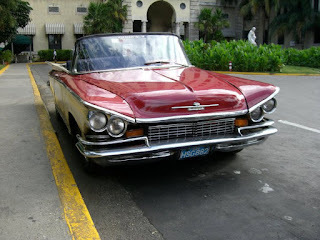 Having had our last breakfast, a full body massage on the beach and a final bit of sunbathing, we left Jibacoa behind and transferred to Havana, where we had decided to stay at the Hotel Nacionale (see day 2). Although slightly out of budget, we loved the idea of staying somewhere so steeped in history- the mafia meet-up, Castro and Churchill have both stayed there, and it truly is part of Cuba’s complex history. Plus, it has a pool. We checked into the hotel, walking through the extremely grand entrance hall, past the signed pictures of past political guests- all of whom seem to be shaking Castro’s hand- and up to our (very) freshly painted room. Despite its history, The Nacionale, like almost everything else in Cuba, has a feeling of tiredness about it. Faded glory, I think Stevie described it as. The building is neglected, inside and out, and despite putting on a good show in reception of past splendor the bedroom was full of unattractive furniture, a dirty carpet and nothing to make your stay seem, in any way, luxurious or personal. Still, it had a pool. We swam and sunbathed for an hour before changing and walking into town. Now, we had done this walk previously- the 3-4 miles from Habana Vieja to Vedado, but this time, for the reverse journey, Stevie decided that he wanted to walk through the town rather than along the Malecon (coastal road)- a ridiculous idea that I agreed to, believing it COULD be exciting. The 4 days in Jibacoa had obviously sent me soft again as I struggled to enjoy the beautiful city, due to the dirt, the smell and the obvious dilapidation of everything around me. Stevie, on this occasion, agreed wholeheartedly, and we jumped in a cab for the remainder of the way, to The Floridita- a bar made famous by Hemingway. Two Daiquiris later, we sat in the bar feeling like we had been transported back to the 1950’s, and scrutinised the pictures of Hemmingway drinking in the bar with the locals, back in the days when this shabby bar would have been the epitome of sophistication. We then walked down to a restaurant recommended to us by the English couple that we met in Pinar Del Rio. Our final night in Cuba was nearing an end and over a mixed fish grill, and a decent bottle of wine, we looked through our pictures- mostly of grand old American cars, and wondered whether Havana would ever be restored to its former glory- and, indeed, whether that would then take away from the charm of the place. 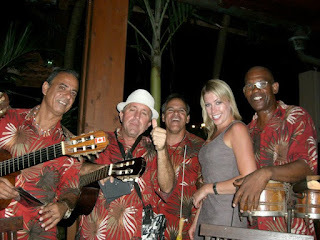 A collection of musicians, Guitarists, a maracas player and a bongo player wondered over and sung/played a mixture of traditional Cuban songs and some more modern British tracks with a Cuban feel- we bought their CD (obviously, why wouldn't we? We now had 4 CD’s of various bands we had seen play throughout the trip). The hour long private concert concluded with me writing down, at their request, the words to “How deep is your love” and then singing them through it to ensure they got the key changes in the right places. After being urged to get up and sing (I guess they thought flattery might get them another CD purchase), which I politely declined, despite being described as Jennifer Lopez in Cuba (is that even a compliment?! ), we exchanged email addresses and took our leave. We jumped in a yellow tuc-tuc back to our hotel and feared for our lives as the small, 3 wheeled vehicle rounded corners like it was competing in the Grand Prix. Arriving at our hotel in our very own Trotter-mobile was very funny as everyone else was pulling up in beautiful Classic cars in the elaborate driveway. We woke early after a dreadful night’s sleep and headed back out into Havana to spend our last few hours (and Pesos) visiting some of Cuba’s cultural highlights. We walked through the city, down the Prado and down to the Revolutionary Museum. Again, another poorly maintained building, which, over 3 floors charted Cuba’s bloody revolutionary history, with large collections of memorabilia- some more impressive than others- including weapons and blood-stained shirts, presumably taken off the backs of those who died fighting Batista’s government and securing “freedom” for the Cuban people. The exhibition, based in the former Presidential Palace, has two floors dedicated to covering the revolution itself, with the standard lack of clarity I had come to expect from Cuba. I knew very little about Cuban history, apart from the research and reading I had done before we left for our holiday, but having walked around the museum, I swear I left knowing less about what actually happened than I knew when I first arrived! The ground floor and final part of the crumbling museum was supposed to be a showcase for “what happened next”, but was actually just a huge propaganda exercise, designed to tell tourists (and Cuban nationals visiting the museum) how fantastic Socialism is and how Castro’s policies and laws had freed, educated and enriched the lives of Cuban people. Yes, education is better and widely more accessible. Yes, healthcare has dramatically improved (There are 80,000 doctors in Cuba- more than the whole of Africa! )- but at what cost? Havana itself is testament to the fact that a lack of private enterprise can stifle a city- both creatively and financially. We left the museum, hot, bothered and upset that even the cultural buildings are used as a tool for the government to control and manipulate the people. A brief sojourn around the Cuban Art Museum, and we braved another tuc-tuc ride back to the Nacionale, where a taxi was waiting to take us to Havana airport. So my final views on Cuba? An amazing country, with many different landscapes- and we only saw a tiny bit of what Cuba has to offer. Havana needs some money- but more importantly, love lavished upon it in order for it to become truly beautiful again. 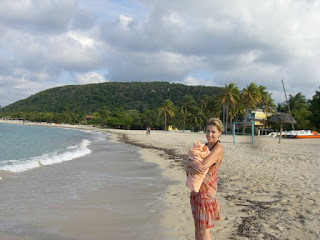 Pinar Del Rio is very reliant, and rightly so, on its stunning scenery and gentle, kind inhabitants. Jibacoa offers the blue seas and white beaches that other parts of the Caribbean trade on, and has (for now) managed to avoid being TOO touristy- but still providing facilities for a relaxing stay. I don’t, and am pretty sure that I may never, understand fully, the politics of this country- but I do think that the music, the atmosphere and the sheer resourcefulness of the Cuban people, make it an unusual and exciting destination.